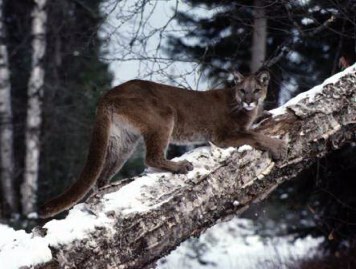 The Puma is a protected, and very elusive animal of Arkansas. The chances of seeing one are even rarer due to the Pumas "human shyness", although this is not always the case . The Puma is about twice the size of the bobcat, maybe a little larger. You could expect one to weigh 180-200lbs. The sound a Puma makes, sounds like a small girl crying out. Very spooky indeed. away slowly. If attacked Fight for your life, because that is what your fighting for !! the smaller side of around 500-600 lbs. Much smaller than the "Grizzly" or "Polar bear" but still quite large. 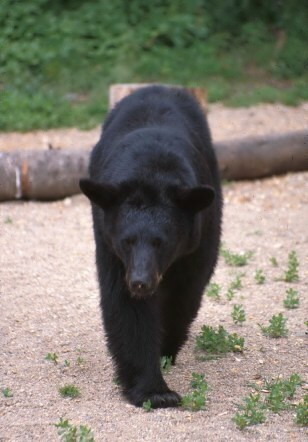 Black bears in Arkansas are not always black. 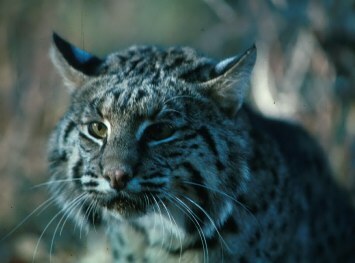 Brown and cinnamon are often associated with an Arkansas Black Bear. Bears can Climb with skill and run very fast. If confronted with a bear always make lots of noise and raise your arms. Try to look as big as possible. NEVER RUN AWAY. always back away slowly, and stay calm but make noise. If charged or attacked, FIGHT, and fight hard !! Always leave a backpack on, it may protect you during an attack. An attack is very, very uncommon in Arkansas. and Most of that danger comes when confronted with a mother and cubs. so LEAVE CUBS ALONE, because MOM is around. But, Bears rummaging for food, even in tents with campers still in them is not so uncommon. Always pack food away from your sleeping area, keep chest / bags tied down or preferably strung from a tree out of reach. Packs with food have been stolen by bears, and campers scarred to death. If a bear starts ripping into your tent... FIGHT. He may be after you for dinner!! The Copperhead is Pit Viper that is found throughout Arkansas. The copperhead is 75 to 125 cm (30 to 50 in) long and has a coppery, bronze, brown, or pinkish-brown body marked with bands of darker brown in an hourglass pattern. The tip of the tail is usually greenish or yellow. 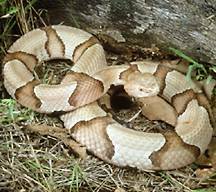 The copperhead is a potentially dangerous snake, although there are very few human fatalities recorded from the bite of the copperhead. It is found in mostly in hilly country. 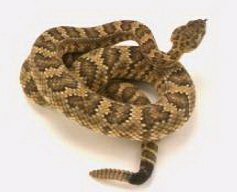 There are 30 species of rattlers, 15 in most of the United States. The picture to the left gives you a pretty basic idea of what to look for, although Arkansas has a few different types. Look at the shape of the head, this is a dead give-a-way to a dangerous Pit Viper. WARNING: Rattlers do not always rattle before they bight! You 'll see Rattlers mostly in Rocky Highlands / Hills - Cavers need to be Extra aware of their surroundings. They tend to exhibit the behavioral characteristics of territorial animals by defending and guarding a specific area, thus appearing to be more aggressive than most snakes. 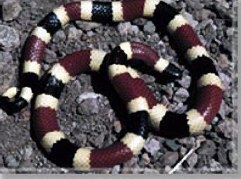 They are Arkansas only Amphibious snake, and are also a member of the Pit Viper Family. Watch out for these when around a creek or body of water. 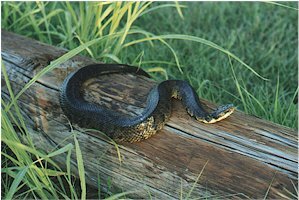 You may find a Cottonmouth up to 5 feet in length. Red and Yellow will kill a fellow !!! Red and Black is a friendly Jack.